In what was a highly contested event for Democratic voters in California's 9th State Assembly District, a slate of seven candidates backed by area progressives and the Sacramento Central Labor Council (SCLC) swept a group supported by, and including, newly elected Elk Grove Mayor Steve Ly. The slate backed by the SCLC won all seven male and female positions. The entire delegation, which will have about 30 members, will have the balance appointed by 9th State Assemblymember Jim Cooper, State Senator Dr. Richard Pan, and U.S. Congressman Dr. Ami Bera. 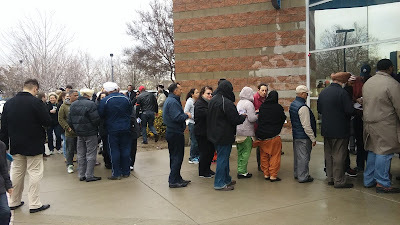 inclement weather and long lines to vote for Party Delegates in Elk Grove. As part of their duties, delegates from each of the State's Assembly District's will help set the agenda of the California Democratic Party. Many participants and candidates involved in yesterday's 9th Assembly race said the election of Donald Trump was a motivating factor in their participation. The event was held at an Elk Grove bowling alley and drew about 600 participants who voted for over 45 candidates vying for the 14 positions. The voting, which was scheduled for two hours, was extend to five hours. Among the contestants prevailing at the top of the SCLC-Progressive slate was Assemblymember Jim Cooper staff member Mikey Hothi who received 434 votes for first place in the male category. 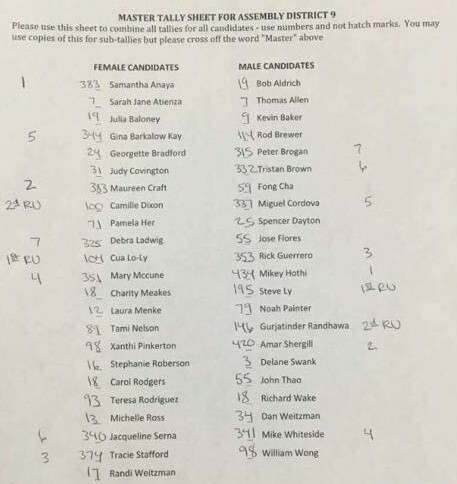 There was a tie for first place for the female candidate between Maureen Craft, who ran for Elk Grove City Council's District 3 seat and Samantha Anaya. Tracie Stafford, who ran against Ly in the Elk Grove mayoral race, came in second place. Following Stafford for the four other female delegates were Mary McCune, Gina Barkalow Kay, Jacqueline Serna, and Debra Ladwig. The other male delegate victors in order were Amar Shergill, Rick Guerrero, Mike Whiteside, Miguel Cordova, Tristan Brown, and Peter Brogan. For Ly, who was recently elected Elk Grove Mayor and who is attempting to expand his political operation, the loss of his entire slate was a setback. Among Ly's slate were Cosumnes Community Services District Director Rob Brewer, his full-time Elk Grove City employee assistant Teresa Rodriguez, his mayoral intern John Thao, Elk Grove Unified School District Public Information Officer Xanthi Pinkerton, and his wife, Cua Lo-Ly. Ly did not respond to an email seeking comment on the results. Amar Shergill, who was one of several who helped organize the strong turnout, said given the unfavorable weather and the long lines to vote, the high level of participation was inspiring.